David Park is a well established author of literary fiction from the North of Ireland, who deserves to be better known than he currently is at present. For instance, he seems to lack an entry in Wikipedia, something which I may attempt to remedy in the near future! 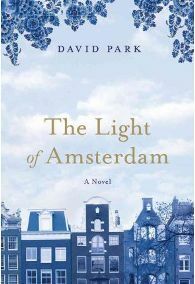 The Light of Amsterdam is his 8th novel, published by Bloomsbury to generally good reviews. It starts and finishes in Belfast, but the bulk of the events occur over a weekend in Amsterdam. The Light of Amsterdam follows the interacting stories of three pairs of characters who travel for a weekend away. Alan is a College lecturer in Art who has recently separated from his wife. His career is failing and he has lost his enthusiasm for his subject and for life. He is planning a trip on his own to Amsterdam to see Bob Dylan in concert, attempting to capture the spirit of an earlier visit at a formative stage in his life. His ex-wife, however, also has plans, and he finds that he has to take his teenage Goth son Jack with him. He thinks that this may allow him an opportunity to break down some of the barriers that marital breakdown and adolescence have caused in their relationship, but it is unlikely that the trip will be an easy one. Karen is a working class single mother heading to Amsterdam for her daughter Shannon’s hen party. She has worked incredibly hard all of her life in a series of menial jobs to provide for Shannon, but has a burgeoning sense that her daughter takes her for granted and is not a very nice person. She has never been abroad before and is anxious about every aspect of the trip and worried about her future. The third couple, Richard and Marion, own a Garden Centre and are travelling to Amsterdam for a weekend break. Marion is acutely aware of the ageing process and worried that she is becoming dangerously unattractive to her husband. Each of them has a secret objective for the trip, and both are in for a considerable surprise. During the course of the novel, the characters bump into each other at different stages of the trip, interacting in a range of ways. Most are concerned in different ways with ageing and the sense that their lives are running out of time and opportunity, but an impression is left that providing they make an effort there is still time for them to reinvent themselves. The writing is strong, the characters interesting and the plot generally convincing, at times a little predictable but also with some surprises. I know both Belfast and Amsterdam well, and both places are conjured up with considerable conviction. The Light of Amsterdam is a gentle book, but with an edge. For me, the ending jars a little with what has gone earlier, but the characters will linger in my memory. Not an outstanding or groundbreaking book, but a worthwhile read. One Comment on "The Light of Amsterdam"